On 8 April 1970, Bahr Al-Baqar lost 34 children when Israel bombed its primary school. 44 years later, families of the martyrs and survivors continue to complain of neglect. As the sun rose on Bahr Al-Baqar, a small village on the outskirts of Egypt’s Sharqiya governorate, Nabila Aly was scared and almost certain that something bad was going to happen. Her eight-year-old son, Mamdouh, had just told her that he wanted his sandwich early because he was leaving and not coming back. "His words were foreboding, I screamed at him. He told me not to be upset, that he meant he wouldn’t be returning during the school break," Nabila — or Om Emad (mother of Emad) — said, retelling a story to which she has returned hundreds of times over the years. Om Emad headed to her oven to bake for her five children. Before she had baked her tenth bread the village has turned dark, fogged with smoke, and the windows and doors of her humble house came crashing down. The Israeli Air Force has bombed the school nearby. "Help, mama, the school has collapsed over my brother!" Om Emad’s daughter said as she delivered the news. This was 8 April 1970, or "The Black Day," as the villagers of Bahr Al-Baqar call it. Israel claimed that the bombing was an accident and that it mistakenly thought the school was a military base. The incident took place after the 1967 war, when Egypt was defeated by Israel. 1967 was followed by six years of on and off battles, known as the "War of Attrition." Eight years old Mamdouh was killed along with 33 other children at Bahr Al-Baqar Primary School when the US-made F4 Phantom II bombed the site. More than 50 children were injured as well. 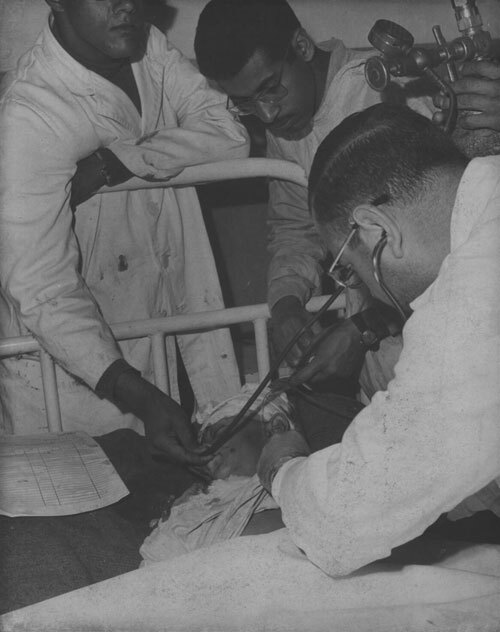 The corpse of Mamdouh was delivered to his mother in two pieces. "My children and I sat on remains of bodies on the back of a truck. We took Mamdouh to bury him next to his father in a village nearby," said the old widow. Following that day, life was never the same again for Om Emad. The sounds of Israeli planes continued to haunt the village and fears of another attack never abandoned her. "We have witnessed a lot of agony since the Black Day (8 April 1970). It wasn’t until 1973 that we finally took our breath," says Om Emad, referring to the end of the Arab-Israeli war in October 1973. Om Emad’s loss of her son was never compensated. Until now, 43 years later, she complains of being neglected, left in poverty, and promises unfulfilled. "The injured and families of Bahr Al-Baqar’s martyrs are all of low income. Even the LE100 that we used to receive from the government has been cut for me for almost six years because I refused to bribe the cashier," she said, adding that she has been seeking land for her and her children since 1984. The governor of Zagazig promised her the land, but the promise was never met. Several survivors and families in Bahr Al-Baqar echo Om Emad’s sentiments. "We’ve been complaining, demanding compensation. We got nothing from the old regime, nor the new one. They promised us pilgrimage and work but gave us nothing," lamented Al-Sayed Hassan, one of the survivors of the massacre. Another survivor refused to speak to Ahram Online, screaming, saying he is tired of speaking to the media every single year and yet nothing changes. "Bahr Al-Baqar has been long forgotten. Every year, journalists and media speak to us. They ask us what we need and promise to help, and nothing; we get nothing," Ahmed El-Dmeeri, one of the survivors, told Ahram Online. Fifty-year-old El-Dmeeri said it agonised him that the martyrs of the January 25 Revolution, who he says were killed during a face-off between Egyptians and other Egyptians, have received financial compensation and honour while Bahr Al-Baqar — bombed by Israel — is ignored. "We were the ones humiliated by Israel. It (Israel) crippled many of us, yet the government never asked about us, not by money or with Umra (the smaller pilgrimage)," added El-Dmeeri. El-Dmeeri was only eight when his school was bombed and he was badly injured in the head and feet, injuries that left him unable to work in anything that requires a lot of physical or mental effort. "I was sitting in my math class Wednesday morning, next to my dear friend Ahmed, when the Israelis attacked our school." "My pencil had fell under the desk. The moment I went underneath to pick it up, the school was bombed. My father later told me that the desk broke on my head, leading to concussion," El-Dmeeri went on. After 25 days without consciousness, El-Dmeeri was told that Ahmed, his best friend, had been killed in the attack. "Ahmed, my friend, was his father’s only boy among five girls. His father is now old and jobless and does nothing but wait for aid from people. Maybe if Ahmed was still here he would have been something and shared the burden of his father," said El-Dmeeri. It is not only the memory of the young martyrs or their families that has been forgotten. 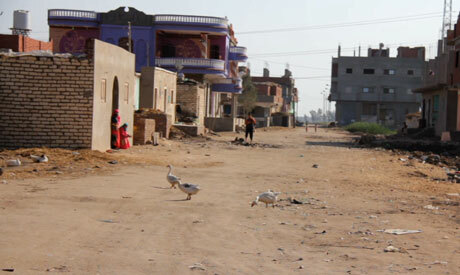 The village of Bahr Al-Baqar itself speaks of neglect and isolation. Unpaved roads, undrinkable water, lack of healthcare and poor education is what marks a village that paid a high price for Arab resistance to Israel. According to El-Dmeeri, many residents of Bahr Al-Baqar are suffering from renal failure and hepatitis from the water. He adds that while the government has been spending lots of money on building a huge and well-equipped hospital, now they want to just make it a clinic. "All services are deteriorating in Bahr Al-Baqar. This village must be a model, for those children who died and the blood that has been shed," adds El-Dmeeri. Without hope of securing his rights from the Egyptian government, El-Dmeeri decided in 2009, after being advised by lawyer Essam El-Islamboli, to file a lawsuit against Israel. "Our lawyer affirmed to us that such cases never becomes void by time, because it is a war crime," said El-Dameeri. On 7 January, the spokesman for Israeli Prime Minister Binyamin Netanyahu tweeted an Egyptian nationalist song that was originally written to mourn the death of children in the Bahr Al-Baqar massacre, to express Israel’s appreciation of Egyptian nationalist songs. The tweet was met with a storm of outrage among Egyptians online, who reminded Israel of the crimes it has committed against Egyptians and Arabs. "All we want is for Egypt to live in peace, but at the same time for Egypt to take care of us," said El-Dmeeri, underlining that he has no wish for war and destruction to return. Sad History, what’s the point! 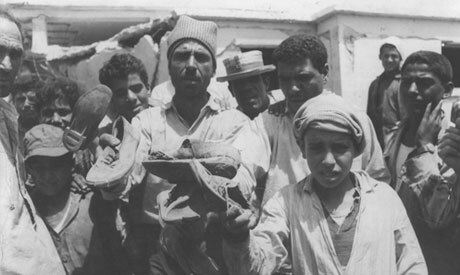 The massacre was a sad episode on the road of the Egyptian/Israeli historical conflict. A flashback NOW would serve nothing but open a wound better kept bandaged, especially with the current economic and social hardships facing the Egyptian people. Hardships that cause plenty of anger, and if the timing of this ‘flashback’ is to direct this anger elsewhere but at the deficient economic and political system sweeping the country, the effort is misdirected. As an Egyptian, I am sadden by that war crime, which took the lives of many innocent children; also as an Egyptian, I am MORE sadden by the state of our economy, social justice, and lack of freedom in my country, all have nothing to do with the historical Egyptian/Israeli conflict! Is the economic and political situation for the regime so bad that they have to drag this out to deflect criticism? who wanted the war and try to destroy israel ? who caused the wars ?